Inspired by the Art Deco era, this Bronze Chaise VIII makes a pretty addition to a bedroom or dressing room. 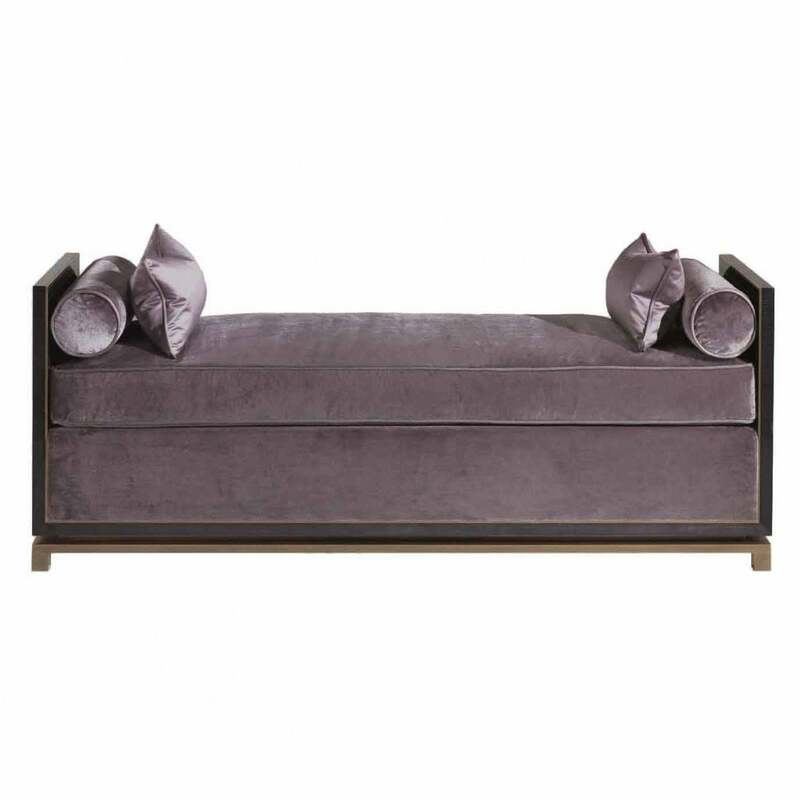 Shown here in a rich amethyst colour, the chaise includes 2 x roll cushions, a sturdy bronze base and bronze inlays. Feminine with an androgynous edge it evokes Hollywood glamour with a film star feel. This piece works well with both a neutral colour palette in soft greys, gold and off-white and with a dark and dramatic scheme of deep blues and black washed walls. Pair with a statement chandelier that glitters above the chaise for ultimate glamour. See our selection of Eichholtz chandeliers for more inspiration. Priced in the brands own luxurious fabric, this armchair is also available in a material of your choosing from our extensive fabric library. Available in a range of finishes including natural black American, walnut, oak and figured sycamore. Priced for Natural Black American Walnut or Figured Sycamore stained dark grey in high gloss finish + bronze or Figured Sycamore stained dark grey in high gloss finish, bronze trimming detail inside/outside arms, bronze base; n. 2 bolsters and seat cushions padded with a core foam with feather wrapped all around and upholstered in Rubelli ‘Venezia’ fabric range, colour Fumo with piping in Dedar ‘Tabularasa’ fabric range, colour Souris. With 2 x loose decorative pillows cm. 45wx30h upholstered and piped in Dedar ‘Tabularasa’ fabric range, colour Souris.